(PU) Polyurethanes Market size was over USD 50 billion for 2015 and is forecast to witness growth at over 5% CAGR from 2016 to 2023. Rising energy conservation importance due to increasing costs along with shift in preference towards high efficiency and low GHG emission material will drive the polyurethanes market growth. PU expects strong demand from furniture, automotive, bedding sectors and interior applications. 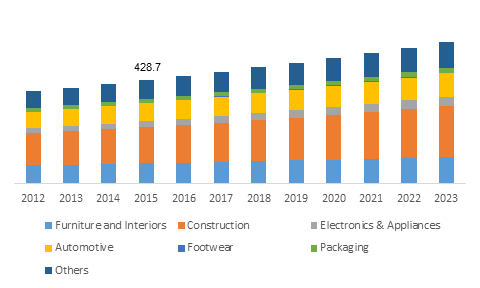 High performance, light weight properties along with rising demand from automotive and electronic appliances for usage in interior trims, refrigeration insulation and seat cushioning should fuel polyurethanes market growth. Government support for infrastructure development has facilitated the overall construction industry. The industry global spending was over USD 8 trillion in 2015 and projected to cross USD 10 trillion by 2020. China, with Brazil, India, SEA and Mexico will be the key contributing countries. The product is widely used as insulator in construction. Positive outlook from automotive industry along with increasing preference for light weight vehicle to improve fuel efficiency will drive growth. Support from Corporate Average Fuel Economy (CAFE) has enhanced automobile manufacturers to investigate new routes. Automobile industry has witnessed high gains with 2014 sale units of more than 65 million, which will positively drive the industry. Decreasing PDI, MDI and polyol costs due to weak crude oil signs which may devalue polyurethanes market price trend. Market profitability is expected to improve with crude recovery, anticipated towards 2017 end. Innovations and commercialization associated with bio-based polyurethane will present new opportunities to the industry players. Rigid polyurethanes foam market size exceeded USD 10 billion valuation for 2015, with more than 5% CAGR estimation. The product is widely used for insulation in construction industry. Effectiveness to decrease thermal energy losses and increase buildings energy efficiency are the key properties. Rising importance for energy conservation and carbon emission reduction will facilitate industry demand. 2015 Flexible foams market revenue was in excess of USD 13 billion, improving lifestyle, increase in disposable income particularly in India, China, Brazil and Russia will benefit the product penetration. Rising demand from upholstery, vehicle seating, insulation for refrigeration and construction applications has fueled flexible foam polyurethanes market growth. PU elastomer market will witness notable demand owing to shift in trends towards rubber component replacement by polymers. The product will contribute over USD 14 billion revenue by 2023. PU coatings will witness growth over 5%. Strong application scope in automotive, hardwood, and construction will facilitate the industry growth. Construction applications accounted for over 30% of 2015 global polyurethanes market share. Flooring, sealants and insulators are some of the major revenue contributing applications. Polyurethane sealants are used to fill gaps in order to prevent air and water leakage. Growing importance towards energy conservation has positively influenced household insulation demand. Automotive applications generated more than USD 8 billion in 2016 business. Germany PU market size from automotive application will witness growth over 3.5% CAGR up to 2023. Increasing requirements including excellent grip in boots and sports shoes should fuel PU demand from footwear application. China footwear application contributed over USD 800 million in 2015. U.S. polyurethanes market will exceed USD 12 billion in sales by 2023, rigid foams will witness 4% growth in terms of revenue. Regional development and rising demand for spray PU foam in thermal insulation applications will trigger the regional industry growth. Europe polyurethanes market size was worth over USD 14 billion demand in 2015. Growing demand for insulation from low income households for energy efficiency along with supportive regulatory compliance will drive product development. Asia Pacific will witness notable growth, owing to the increase in construction spending in developing nations including China, Japan and India because of upsurge in industrialization. China PU elastomers market was worth over USD 1 billion in 2015. Polyurethanes market share is consolidated and competitive in nature due to presence of multinational companies acquiring strong positions in the ecosystem. Bayer, BASF, Huntsman and Dow are the key companies contributing over 55% of total demand. Presence of numerous domestic companies in Asia Pacific may impact profitability, in terms of low offered prices. Other industry players include Foamex Innovations, British Vita Unlimited, Nippon, Woodbridge Foam Corporation, Recticel, Nippon and Mitsui Chemicals. Expansions, mergers & acquisition and joint ventures are among the key strategies used by the major market players. BASF acquired global surface treatment provider Chemetall and automotive refinish coatings assets of Guangdong Yinfan Chemistry, also it expanded by constructing new production complex for thermoplastic polyurethane (TPU). PU is a plastic material or polymer consisting of organic units linked by carbamate links. Main sources of its formation include di-isocyanates, tri- isocyanates and polyols, along with these amine catalyst, bioderived material, hydroxyl and amine terminated compounds are used in its formation. Foam and non-foam PU are further modified by using surfactants. Hydrogen bonding also determines the properties of final PU product. The product does not melt when heated, which are known as thermosetting polymers. They are also available as thermoplastic PU. Polyurethane are available in various forms and has broad range of applications including insulation of refrigerators, cushioning, mattresses, adhesives, coatings, sportswear, rollers and tires, they are also used in bio medical applications.